Is een additief dat is ontworpen om de uithardingstijd van sommige Smooth-On urethaan vloeibare rubber producten "versnellen". 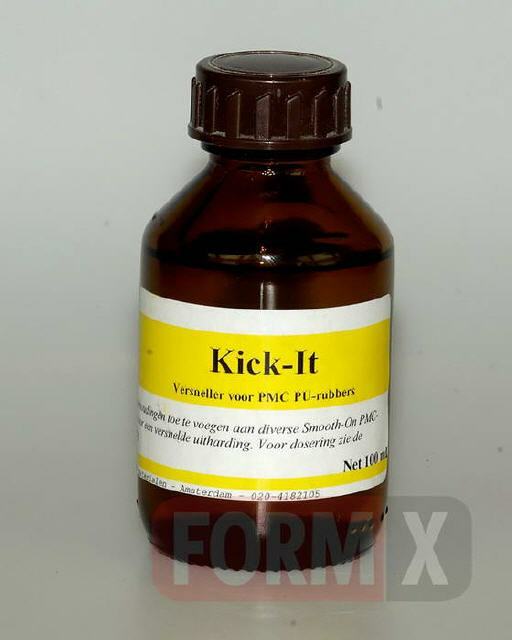 Kick-It Cure Accelerator for PU rubbers - flask 500 ml. Safety – Use in a properly ventilated area (“room size” ventilation). Wear safety glasses, long sleeves and rubber gloves to minimize contamination risk. Store and use all products at room temperature. This product has a limited shelf life and should be used as soon as possible. Wear gloves and eye protection to minimize risk of contamination. Measuring and Mixing - All components must be measured using an accurate gram scale. The accelerator is added by weight to Part B and should be thoroughly mixed into Part B before adding Part A. Note - No significant increase in demold time was noticed at percentages greater than 3% except with PMC® urethane rubbers, which can be accelerated at greater speeds than ReoFlex® or VytaFlex®. Demold time can generally reduced by one half by exposing the material to 150° F.
Example – VytaFlex®10 (1:1 Mix Ratio): To reduce the demold time of VytaFlex® 10 from 24 hours to 7 hours, add 30 grams of accelerator to 1000 grams of VytaFlex® 10 Part B. Mix thoroughly for at least one minute, making sure that you scrape the sides and bottom of your container several times. Next, add 1000 grams of Part A and mix thoroughly for at least one minute, again making sure that you scrape the bottom and sides of your container several times. Pour the contents into a clean separate container and mix thoroughly. This will help to ensure that unmixed material does not contaminate the mold. Do not delay between mixing and pouring, as your pot life is about 6 minutes. In about 7 hours, the rubber mold can be removed from the original model. Demold time can generally be reduced by ½ by exposing the material to 150° F.